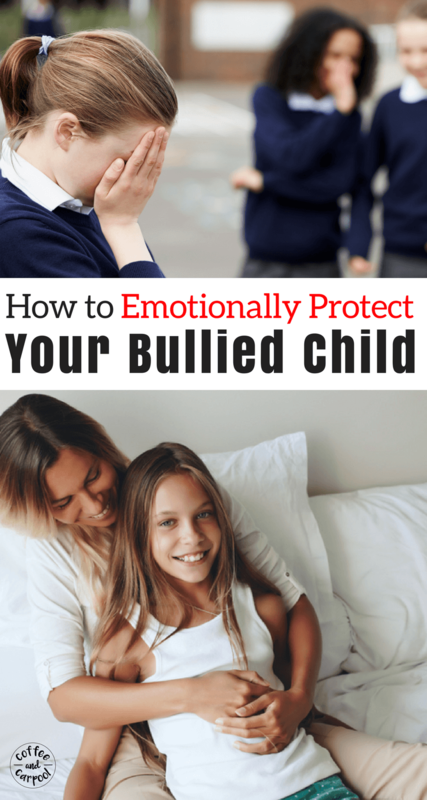 Inside: Emotionally protect your bullied child with these 9 must know tricks for parents. We may not be able to stop bullying or end the bullying, but we can make sure our child’s mental health is intact and they know that the bully’s words and actions are not their fault. My child is one of the many, many kids being bullied. She comes home with stories about being teased, mistreated, and verbally abused. And it breaks my heart every time. No parent wants to hear that their child is hurt. But when your child is on purpose, ganged up on, with malicious intent, you want to scream. You want to break something. And then you want to curl up in a ball to make the pain and hurt—their pain and hurt– disappear. But as a parent, I’ve got to pull myself together. I’ve got to hold in my emotions so they don’t seep into her emotions. Oh, I get angry. And I definitely get sad. I just save that for after she’s gone to bed. I need to keep my emotions in check to protect her emotions. Because even though it’s breaking my heart, I can’t let it break her heart. I can’t let it hurt her soul or change her personality or destroy the kindness and warmth inside of her. My daughter is kind and overly-friendly. She wears her heart on her sleeve. So my first instinct is to protect her emotionally by telling her to stop being so damn friendly. To warn her to close herself off to her peers so she won’t get hurt by them. But that’s the worst advice. That will change who she is. And that kind of damage is irreparable. But she has to be emotionally protected from this time in her life so that she can walk away from her childhood intact. I have to protect her and her sweet personality from changing into a cold, hardened outer shell of her former self. I have to make her resilient. Emotionally resistant to their words and emotionally strong. I need to make sure that this time when she’s being bullied isn’t the only story of her childhood. I can’t let it dominate her memories of this time. 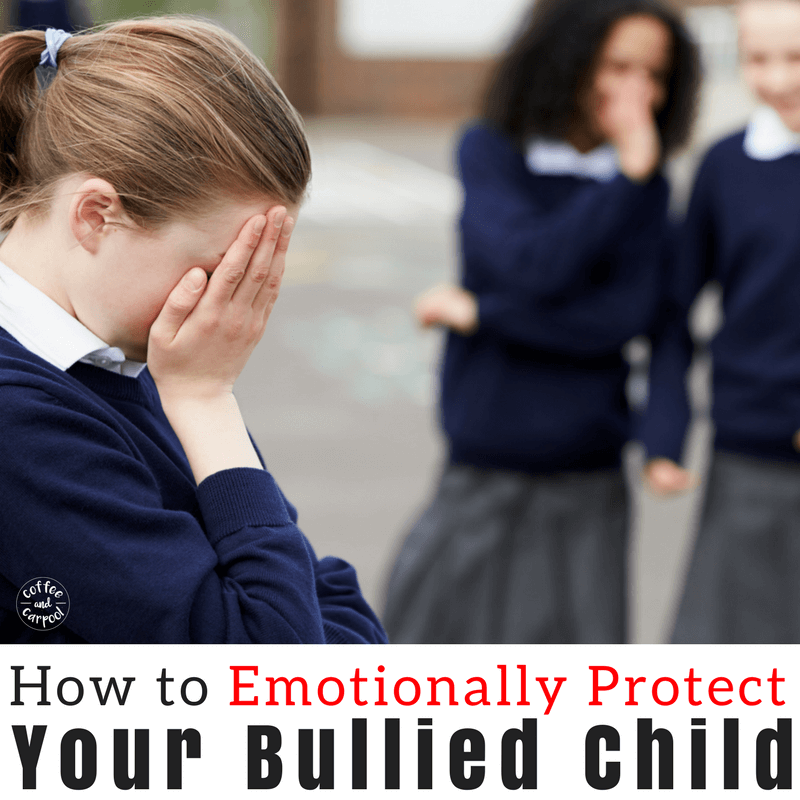 There are ways we can protect our children emotionally from letting the bullies get to them and harden their outlook on life. 1. Remind her every day being bullied is not her fault. Victims are often made to feel that it’s all their fault. That if they were cooler, or didn’t tattle tale to the teacher, or were less smart, or were smarter, or were less disabled or were less different, they wouldn’t be bullied. Listen, My kid is no angel. She tattles, she’s bossy, and she does socially immature things like twirl and dance in the hallways. So there may be an explanation as to why she’s being targeted. But there’s never an excuse. And it’s NEVER HER FAULT. 2. Let her know it’s okay to tell. My daughter often doesn’t tell me when she’s being bullied because she doesn’t want to get her bully in trouble. But this need to protect her tormentor has serious, larger-picture consequences. If she is being hurt, she has to speak up. We discuss often the difference between tattling and telling. It was important when she was three. It’s way more important now. Kids who are bullied often don’t speak up for a myriad of reasons. Let them know it’s always okay to tell a trusted adult if they’re being hurt or harmed in any way. 3. Teach her to speak up and advocate for herself. Once my daughter tells me about a bullying incident, she’s not done. She has to learn to advocate for herself. So I don’t try to fix the problem immediately for her. Now don’t get me wrong. I want to. I want to swoop in and fix it all and squash all the bullies and make sure every administrator knows the names of every bully at the school. Mama Bear wants to tear it up. But that is doing a disservice to my daughter. She’s not going to be bullied just once. These kids are repeat offenders. So my daughter has to know what steps she can take. She talks to her teacher or emails her the problem and what she wants done. We follow a format now: This is what happened, and please help me by…. I follow up with an extra email to the teacher to ensure communication and transparency and I blind copy myself on the emails my daughter writes. While it is not her responsibility to fix the bullying problem, I want her to learn what steps to take so that help can be sought after and then received. I want her to write to her teacher and ask for what she wants. I want her to play an active role rather than a passive one so she feels empowered and not an out of control victim. She might be sad or devastated. She might be angry. She might be confused. She might be embarrassed. She might be all of the things all at once. Encourage her to talk about it. Encourage her to write or draw about it. Encourage her to take deep breaths and listen to calm music until she’s able to dissect how she’s feeling. Some kids need alone time, and some kids need to be with you. A word of caution, though: don’t let them spend too much time alone after a traumatic experience. Their social and mental immaturity leads to an inability to pull themselves out of negative talk and can lead to a dark spiral. There are ways to help your bullied child if their mental health is in question. 5. Pour into her and connect with her. Take the extra time to connect with your bullied child to ensure she’s having positive experiences with her family. Purposefully spend time with her doing things she loves to do and things you love to do together. Have a family dance party, go on a Mom and me date, have a family game night. Make family time and home life a priority so she feels loved. There are simple and fun ways to really connect with your child so they know home is a safe and loving place to come to. 6. Make sure she has a safe group of friends. 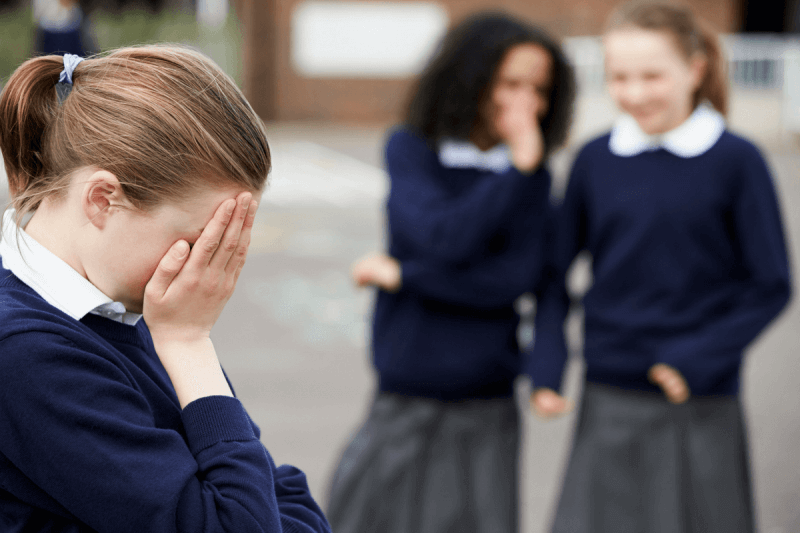 If she’s bullied at school, connect her with kids on a sports team or in a religious class or Scouts or neighborhood friends. Find her a positive peer group because she has to have a place with peers that feels safe so she knows not all kids are bullies and she learns that she does not need to come to expect that behavior everywhere she goes socially. She has to feel worthy of friendship. Purposefully plan play dates or hangouts with safe, friendly kids who will be her ally at school. Get to know her friends. Be the house that the kids want to come visit. 7. Encourage hobbies to boost her confidence outside of school. It doesn’t matter if it’s sports, art, or music. But give your bullied child something new to learn that they enjoy. Something to work towards. Or encourage them to continue a hobby that they love. For my daughter, it was karate. 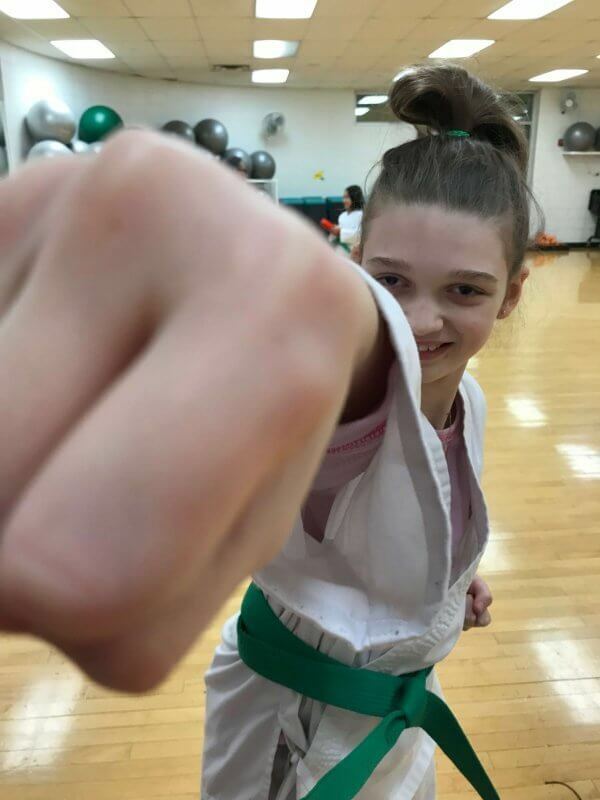 She is confident with her ‘ki-yahs‘ inside her dojo, and she’s more confident in speaking up for herself now outside of the dojo. And confidence when facing off with intimidating bullies could make all the difference to ward off a bully’s attention. 8. Talk to her often. Check in often. Ask questions about weird or different or out of character behavior. Ask open-ended questions and focus on listening to her answers. Keep your emotions in check. My daughter has gone days and weeks before telling me something terrible had happened. So now I ask. And I ask often. Because once, I had to hear about a bullying incident from another mom friend whose daughter told her. I want and need my daughter to know she can come to me. I will be here to listen. I will be here to comfort her. Because if bullying happened once, it will probably happen again. 9. Teach her healthy ways to react to the bullies. My daughter was really struggling with coping with how to react to the bullies’ mean words. Since she wears her heart on her sleeve, when her bullies saw her emotional reaction, it tended to fuel the fire and encourage them. They knew they were getting to her. And it made things worse. She can be fierce and tell them to “STOP!” with a strong voice. She can laugh it off with this one magic trick that works for us. She can shrug it off and not let them see that they’re getting to her. She can get help from an adult. There’s no easy cure-all for bullying. There’s no simple way to take the target off your kid’s back if they’re “different.” And getting schools to take action and step in can be particularly challenging. But even if you can’t stop or prevent the bullying from happening, the most crucial thing we can do is emotionally protect your bullied child. To ensure our kids realize they don’t deserve to be bullied, they are incredible, and they are loved. And they’ve got a Mama Bear ready to protect them fiercely. 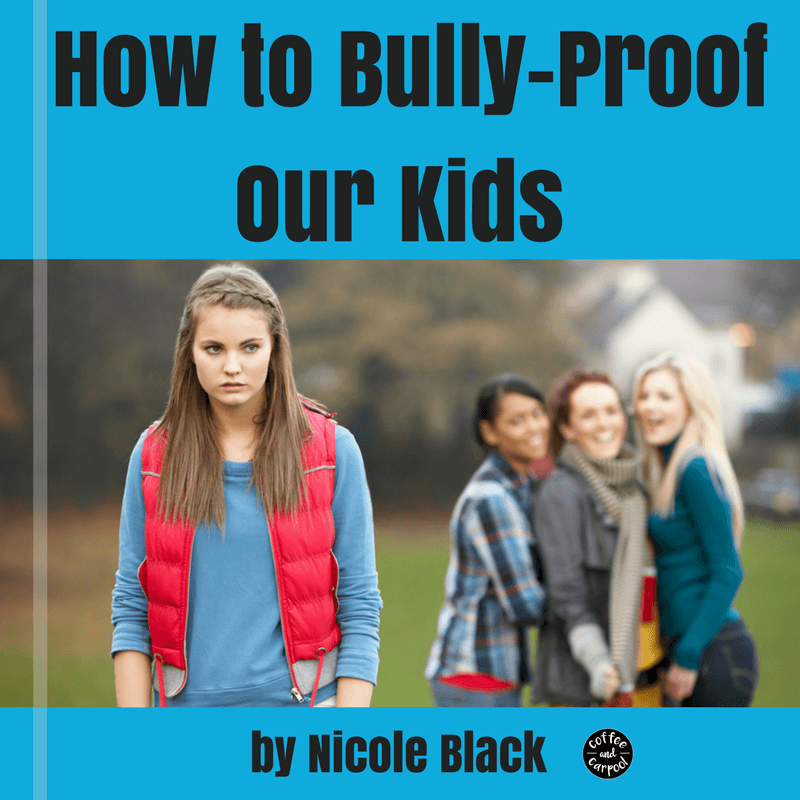 Would you like to Bully Proof-Your Kids? A must read post for every parent. A child never gets over being bullied. My son was bullied because he moved to a school in another area and was not in tune with what was hip. He was in therapy for a while and eventually changed schools. For a long time, he was afraid to trust kids his age. He’s ok now but it was a difficult time. We need more articles like this to empower parents with info about how to deal witg the scourge of bullying. Thank you for a great read. I’m so sorry your son struggled. It is a constant worry! My daughter just started her new school today… which has me once again nervous and on the lookout for signs she’s being bullied again. Thank you for your kind words.